At the age of 7, pre-teens are looming, but for the most part, this is an exciting age where kids are really beginning to question the world around them and start to really understand what interests them and what doesn’t. This can make for weird and wonderful conversations at the dinner table but more crucially, makes finding Christmas presents a pretty fun task. By the time your little ones hit the ripe old age of seven years old, they are quite capable of using technology such as computers and tablets, probably with more finesse and logic than us grown-ups! But, if you don't want to encourage too much screen time this festive season, there are great tech gifts for kids that encourage learning and fun without losing them to the latest TV show on the iPad. So keep your eyes peeled for gadgets that will enable you to keep their childhood alive including some new and retro toys and games will make Christmas this year all the more fun for the whole family, including the classic Tamagotchi and even their very own kids digital camera. We’ve picked out a whole mixture of great gift ideas for Christmas 2017, including arts & crafts, electronics, games and musical toys to cater to both boys and girls with a whole host of hobbies and interests. There are even some books and educational gifts that will provide hours of entertainment to children who are fascinated by reading and science. 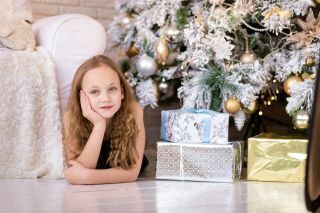 So check out our guide to some of the most fun and entertaining Christmas gifts for 7 year olds this festive season. Twister is a classic game that is a great way to get kids moving and having fun. The game involves a large mat with coloured spots and a spinner and the rules are simple: place your hands and feet on the indicated colours until only one person remains in place. No doubt, your little ones will have played the game before and with its timeless appeal, this is a great alternative to the classic board game this Christmas. It’s an easy concept that is fun for both children and adults alike and will get the family moving after that yummy Christmas dinner. Let the family gymnastics commence! Little girls will absolutely love this jewellery making kit. It is perfect for making bracelets to hand out to friends as well as create many other unique jewellery items. Its super cheap so it would make a great stocking filler, however many parents have noted that the beads and string run out quickly, so one set per child is advised to avoid arguments between siblings. The beads are easy to thread meaning parental supervision is rarely needed with this craft set other than to oversee from a safety perspective. A perfect stocking filler for 7 year old girls. By 7 years old, children start to really discover their firm interests and hobbies. Learning to play a musical instrument is a common occurrence around this age, so why not treat them to this ukulele and encourage some creativity at home which may then lead to them discovering a talent that they love. In a range of fun colours to suit both boys and girls, you also get access to a free downloadable song book to help them learn to play. Ok, so the noise might drive you mad, but this is a sure fire winner for any music lovers. This kids camera will allow children to make great memories wherever they go with a 2MP lense and a range of funky filters and effects. It allows you to take pictures and record video as well as edit and zoom on all images. It also comes with 5 different games that can be played on the 2.3 inch colour screen. The only downside is it only comes in pink which might not be as appealing to boys as it is to girls but if your little one is constantly trying to nab your iPhone to snap pics, this super-fun kids gadget will allow them the freedom to take pictures all of their own. The Tamagotchi has turned 20! Many of us may remember this from our childhoods and the little digital pet is still going strong. It comes with 6 different styles that match the original Japanese Tamagotchi and it comes with a key chain so children can take it everywhere with them. The plus side is this game will keep kids busy on long journeys in the car or keep them quiet at home after school, but the downside is they can get quite attached to these little things, but at least you can turn the sound off if it gets too irritating. If your children love to read, then they’ll love this 15 book box set of fun fictional stories. They come presented in a lovely box which allow for them to be stored neatly in the bedroom so they can easily be re-read over and over again. For any fans of Roald Dahl’s fiction, or any parents that want to encourage their 7 year old to read more, these classic storybooks provide a variety of different stories that are perfect for bedtime reading, including Matilda and Charlie & The Chocolate Factory. They’ll also be a great gift that can be passed down to younger siblings over the years. Learning about the solar system can be tricky but it certainly isn’t boring with this cool solar system planetarium. Not only will this make remembering the names of the planets easy, it is a creative gift that allows children to build and paint their own solar system to put on display. It glows in the dark which makes it even cooler and it's both educational and fun for children make it a guilt-free gift for 7yr olds this Christmas. The planets can be a little fiddly to paint, so some help from an adult may be required, but when it is finished, children can be proud of the masterpiece they have created. For Batman and Lego loving little ones, this Batman watch allows for creativity and learning as you build the watch before wearing it and learning to tell the time on the easy-read face. This watch is the perfect gift for comic book lovers who are also very creative. It can be a little fiddly to put together and is definitely not as robust as a regular watch, but it makes a cool collectable for LEGO fanatics to wear around the house. If you have a 7 year old in your life who is obsessed with Lego or Batman, this is a great gift option. Think these gifts are a little advanced? Check out our guide to Christmas gifts for 6 year olds here.